The ValveTrain ThunderTrain is inspired by the highly revered Valco (S*pro) Thunderbolt of the mid 1960’s. What sets The ThunderTrain apart from the other versions of this classic amp is that its circuit is accurate to the tube rectified version of the original amp. To reinforce the ThunderTrain’s pedigree it is built using the 35 Watt Valco spec American made transformer set from ClassicTone. These transformers are manufactured to the original blueprints by the same factory and even on the same winding machines as the original mid 60’s Valco Parts. 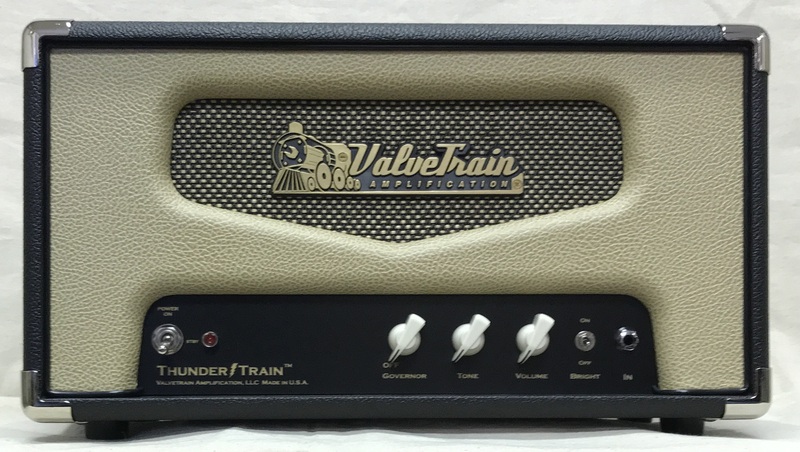 The ThunderTrain makes every effort to truly capture the magic of the classic amps with it’s 35 watts of hand wired pure 5881 tube driven power. Pushed hard, there’s a world of rich overdriven tones to be found. Rolled back, the amp produces wonderfully punchy clean tones. The simple and utilitarian front panel controls consist of the original Volume and Tone controls. To allow the modern player additional choices and flexibility we have added a Bright voicing switch and the Governor control. We also added a Pentode/Triode switch to the back panel to bring the amp down to 17 watts. Our Bright Switch adds a bit of sting and vibrancy to the top end without being shrill or overpowering. The Governor is a output power management control originally designed by Dennis Kager. ValveTrain is pleased to bring this control back to the market through a special arrangement with Dennis. The Governor can be completely switched out of the circuit enabling the full output from the power amp. Power reduction via the Governor is variable. The further the Governor is advanced the more the power is reduced. Once activated the Governor can variably tame the wicked good 35 watts of dual 5881 power down to an apartment friendly 2 watts. With the Governor off, the amp in Pentode mode and the Bright switch off, it’s all Chicago 1965…. By staying true the original 1960’s circuit and using ClassicTone transformers built by the same factory and specs, the Thunderball captures all the magic that has made the Valco amps of the 60’s so desirable. To meet the needs of today’s player the additional features all work together to take the classic design into the future allowing the player the ability get “their” ValveTrain sound every time!